Hillsborough, NJ (September 5, 2017) – Du Verre Hardware and Top Knobs, jointly announce the acquisition by Top Knobs of the Du Verre Hardware brand. 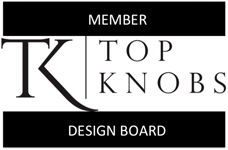 Together, Top Knobs, Du Verre Hardware, Atlas Homewares, Vesta Fine Hardware, and their sister company Hardware Resources’ brands, Jeffrey Alexander and Elements, represent the most compelling product selection in the industry for cabinet hardware. As an award-winning company, Du Verre Hardware has a strong history of raising the bar on innovative designs through progressive manufacturing techniques. Each piece of the brand’s hardware is crafted of post consumer, eco-friendly recycled aluminum fully compatible with LEED objectives. Du Verre Hardware stands for luxury, quality, originality and environmentally friendly decorative hardware. Under the creative direction of founding partners Gina Lubin and Gavin McLean, the Du Verre brand has gained recognition throughout the design world for original hardware designs. The team has sought out the talents of an outstanding roster of award-winning designers, craftspeople and artists to create one-of-a-kind collections. Lubin has guided the creative direction of the hardware company since its inception and has created some of the most intriguing Du Verre designs to date.